We could go on and on about the beauty of the George School campus. There’s the bucolic landscape that’s gorgeous any time of year. And there is the warmth of the buildings, both new and old. A wall of windows overlooking a rain garden makes the library a cozy place to open a book or laptop, while the warm patina of wood makes Bancroft and Retford equally cozy places to open your mind. Let’s face it, though. Words like bucolic and patina sound more like SAT prep than the best way to get a feel for our campus. For that, check out George School 360, stroll around our interactive map, and of course come visit. Then you can get a real feel for the life of this place. Advice from our Admission team. 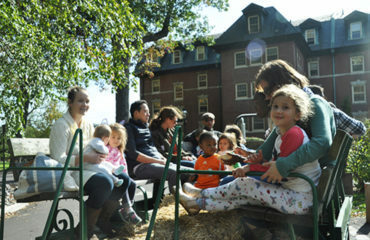 George School invites you to join the community for one of the school’s most beloved and longstanding traditions, Harvest Weekend, on Saturday, October 27 and Sunday, October 28. 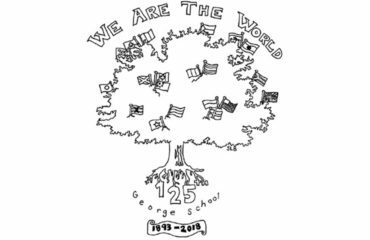 Students will have the opportunity to celebrate George School’s 125th anniversary with their own event We Are the World in Marshall on Saturday, October 20 from 7:00 to 10:30 p.m. 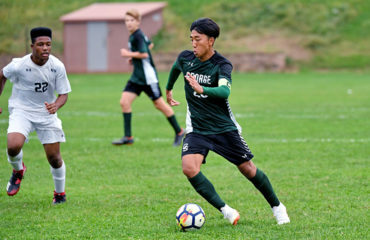 The George School varsity boys soccer team remains undefeated in the Friends Schools League (FSL) with a 2-1 win over Abington Friends School on Friday, October 5, 2018. When you visit, take some time to check out the quaint borough of Newtown, in historic Bucks County—a quick one-mile walk. George School may be older than your great-grandparents, but Newtown is older than the country itself. Nearly a century older. And not long ago, it was named one of the best small towns in America. Can’t get much better than that. Beyond walking distance but still nearby are more shopping and movies, parks and natural areas, and the charms of towns like New Hope, Pennsylvania, and Princeton, New Jersey. When you want more, take a van to area attractions and fun expeditions as well as to trains to New York, Philadelphia, and Washington, D.C. even. Having these three cities—and all their wonders—easily accessible is awesome. Truth be told, though, there’s enough happening on campus that boarders don’t feel like leaving very often and day students routinely come back on weekends. It’s all part of the life of this place. People want to be here. It just feels like home.